The torso is cake covered with buttercream, and dressed with fondant clothing, arms, and feet. The ‘skull’ is made of “brown crunch,” which is like Rice Krispies Treats. But… brown. Fondant makes up the features of the head, including those distinctively-Yoda-ish ears. 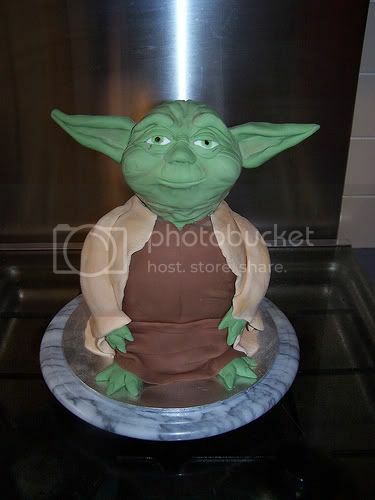 Sandra even posted the step-by-step instructions for creating the Yoda cake on her blog. She says it’s “…easier than it looks!” So is solving a Rubik’s Cube, Sandra. Just give me a year or two to practice. She crafted the cake for the brother of a friend. Clearly, this is a man cut from the same high-thread-count cloth as I am. Sandra also tells me that she makes all of her amazing cakes for fun, not for profit. Perhaps I’m losing something in the translation from Australian, because in American… that’s just crazy talk. I hope my readers will leave comments and help Sandra feel rich in admiration, if not in American–or Australian–dollars. In America…that IS just crazy talk! Sandra, you should sell them to the geek community…many of them have large amounts of money due to being a geek, and therefore irreplaceable in the PC-Internet-crippled nation of the USA. You are an artist madam! I heard this mentioned on the latest Forcecast and had to see for myself. Amazing! Where in the world do you get Star Wars cookie cutters? !